Great day for Canadian Hockey!! Yaaay! Canada won the final hockey game of the Olympics! I am so proud to be Canadian, and so impressed with the patriotism seen over the last 2 weeks! Started with a 3 hr run with great friends this morning. Raced home for a quick 5 min shower, 15 min prep to head out the door to a friends Olympic party. No time to eat post run. Soo happy they had food at the party! A perfect day! Run, fun, and friends! 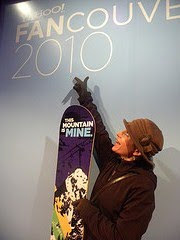 FINALLY enjoying the Olympic spirit! Dropped my daughter off at skating at 6 am then easily took the transit train down town. I checked out most things before 10 am! This was the Crazy line up to see the CANADIAN MINT at 7 am!! Line-ups for the BAY Olympic Clothing just as long! I dont get it! Thats All. I could have got into the partying 'IRISH house at 11 am, but wasn't up to drinking at that point! " I logged a good 10 miles of shopping, Robson St to Denman, up Granville then down to Yaletown. Will do a double this weekend then taper for Dirty Duo 50 K - yaay! I was recently criticized by a trailrunning colleague about my 5 hr run I did a few weeks ago. He insisted it was not necessary and, well, was basically 'stupid'...and not in line with a programmed 'training plan' he outlined for the group . It may mess up my 'peak'.. for what? the olympics? NO! just another fun 50k adventure run- of which I have several planned for the year. Why did I do it? Because I could! It was fun with friends, interesting, and Jim and I had a greater sense of accomplishment, confidence and self worth than we did when we finished our first Marathon! There was no flags, finish line, or medals... Just memories. Ooops! I did it again! Apparently Monday is supposed to be a day off running... but not in this beautiful weather! There is NO way you would find me in the gym, cross training. THIS is why I run ! Entering in races is just a motivator/ destination. Its the training that is the Journey. We should make the Journey as beautiful as possible. I have the ability now to traverse large distances. To fit more into a day than the average person. To go on great run adventures with my husband. I'm no Olympian, just a lady who likes to run. As a physiotherapist and personal trainer, I know how to train. As a human being, I am striving for balance an enjoyment in life. In turn, I have decided to make my training this summer more about adventure = the main reason I got into this in the first place! (sometimes we lose sight... but get back on track) I will have a 'backdrop' of training- the tempo/speed/ taper stuff... but not let that rule my fun! yes FUN!!!! I try to eat 'real food' on long runs. I have the stomach of a billygoat. But, I do add Carbopro in my pack just to ensure I keep my wits about me. I average 200 cal/hr with real food, then gels. IF they made gels that tasted like cheezecake, gingerbread, nachos, french fries, I would probably eat more. Prefer 'GU' to powerbar gels as it is less sweet and less runny- (oh yum). If only I could get it in bulk! My husband, on the other hand has difficulty eating on the run . He has found a new gear in his step with a combination of gels and "carbopro powder" . He is a new man with his 'bonk' ( grumpy, dizzy, walking man) moved from 3.5 hrs to...I don't know. We just did a 5 hr run with no problemos! "If I don't feel right, I may need a thermolyte"
I Now put into a pill holder am/aft/pm/night X2/section=8 pills. Still debating the blister pack idea for longer runs. . I need to figure out how to set my watch to beep on the hour to remind me when to eat etc. After about 3.5-4 hrs I get in a happy zone and lose track of time. I finished last weekend with a nasty chaffing spot on my low back from the pack. Compression shorts so no chaffing... but not so tight I can't pull them up when peeing in the woods. Good 'running bra' that has been well testd that does not give me 'bra burn'. So far UNDER ARMOUR and running room products working. NATHAN hydration pack. The best! with lotsa pockets- except bladder 'weak' . Replaced bladder with PLATYPUS - waay stronger. Since my bathroom is under reno- no ice baths for me. So I'll have to rely on recovery tabs and compression garments. Seems to be working dandy so far. Packing for the long run is now seeming more like packing for a weekend getaway! Whew! But its worth it. While other romantics were lying in bed, drinking champagne,eating strawberries, we were running the trails, drinking carbopro and eating gels! Too funny! 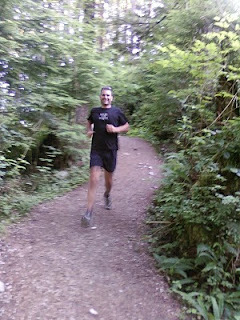 We had a most rewarding 5 hour/ 25 mile run through most of the Diez Vista course. It is probably the best running I have seen Jim do. He has finally learned to eat and drink enough on the run. As you Can see, Jim isn't a little guy, so nutrition is even more important for him. Our great friend Marc came with us ...He led most of the way. He may have been a bit 'spacey' near the end as he mentioned something about going onto the space-ship up ahead. But it was actually the sun shining beautifully thru the trees. Felt great at the end so we flew down the last hill just for fun. Finished Valentines day watching the Olympics, sharing gifts, and eating...lots of eating. The wine may not help with recovery, but hey, its Valentines day. You gotta live a little. Since my husband and I run together, if he "isn't into it", then I don't get a quality run in either...or at all. I do train separately, but prefer to run with someone for the long trail runs. He did a great marathon last yr 3:34. Unfortunately, the big guy 'bonked' on his first 50K and we walked/ran together to finish. He only consumed 600 calories the whole race! It was a huge blow to his confidence and he had little desire to race again. And he repetitively sprained his ankle. CONFIDENCE BOOST Happy Running Again!! 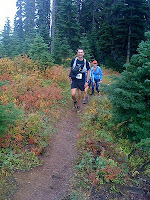 Last weekend we got up early and ran 4 hours/ 20 miles with a 2376 meter elevation gain....and we both still felt GREAT! We were on a high all day. What did he change? -Consume enough calories EVERY hour- duh! My mantra to him was "when you feel the least like eating is probably when you should be eating the most!" So now he is excited again for another 50K. YAAY! - Now I have someone to join me in my enthusiasm for races !!! Now he wants to do a 5-6 hr full DV 50k practice run next weekend. Everyday I see injured people. I treat, educate, stretch and strengthen them to get them back to their sport/work/life. My most challenging patient of late is MY HUSBAND! About a month ago he was running down a trail and did one of those ugly ankle rolls where you can see the foot turn 90 degrees and you're certain you hear a 'clunk'. This is not the first time he has done this! So, he gets all the free physio a husband can get. But does he listen?? No! The next week, since he figures he can walk he does a long run with the gang over Diez Vista (a gnarly trail to say the least). Lo and behold, he sprains it again! Of couse he did. 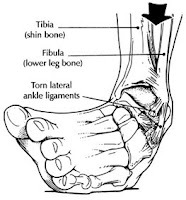 He diddn't even begin to regain his peroneal strength or reaction time...let alone the ligament healing. Luckily half the gang were in a wimpy running mood so they were keen to run him home so I got to continue with the others. 1. Theraband peroneal strengthening exercises- When he crashes on the couch after work I tie his feet together and make him do 30 Reps.
2. Sissel seat balance excercises- It is placed beside the computer and he is to balance on it (2-->1 foot) when he watches videos on the computer. I would prefer a wobble board, but considering his low compliance and that the sissel is only $20, but the WB is $100 . 3. In addition, I work with him one on one doing single leg balance exercises and fig 8's with the theraband. I'm sure that if he had to pay for Physio he would be much more compliant and independent with is exercises. 4. We have been road running (ugh, ...but at least I found a nice long uphill route) and I insist he wear a dynamic ankle brace (allows movement but not to end range so he can strengthen with support) for anything near a trail run. Why am I doing this? Other than the fact that apparently its my duty as a physio and his wife ? I want my favorite running partner back on the trails with me! Plus, since he is 6'3" and I'm 5'3" I really don't want to have to pack him out of the woods .